Project OMG – Page 2 – HubNut – celebrating the average! I owe a lot of thanks for this collection caper, as I usually do to be fair. It’s lovely when folk help out a poor, confused man with his strange, rather baffling dreams. Firstly, the previous owner of the car. He’d owned it from new effectively, as it was his company car in 1997. 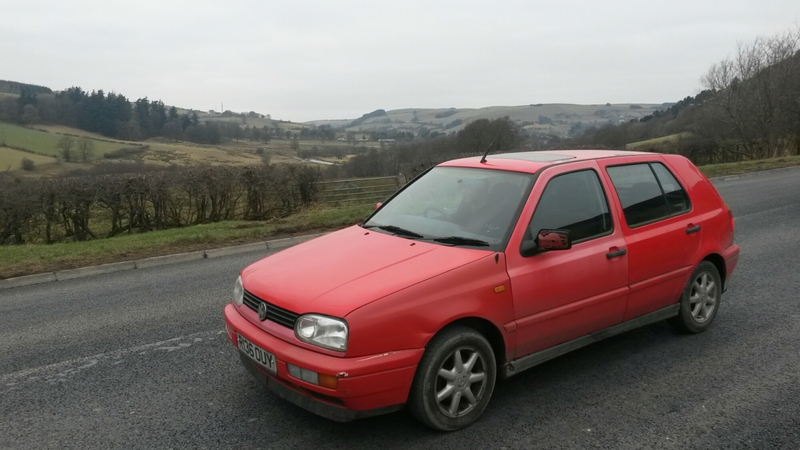 He liked it so much that he bought it at the end of the lease term, which means a continuous history of nearly 20 years – albeit it didn’t move much for the last two. Adrian was hugely helpful with logistics, providing the history of the car (verbally as well as a huge stack of invoices) and getting it ready to depart. He even polished the headlamps before I left to ensure they weren’t an MOT issue! Thanks Adrian, for allowing such a scruffy oik to take on your Omega. (look, I was planning to have to do work. I’m saving my Executive suit for another occasion). Next, I need to thank my taxi driver, Jasper, for taking me right from my door all the way to Bristol. Far nicer to have someone to chat to on a long journey! Jasper is in there somewhere. Next, Steve, or User1979 on Autoshite. A pleasure to buy a Bluebird from five years ago, and a great Help to the Caper. There should be a badge for it really. 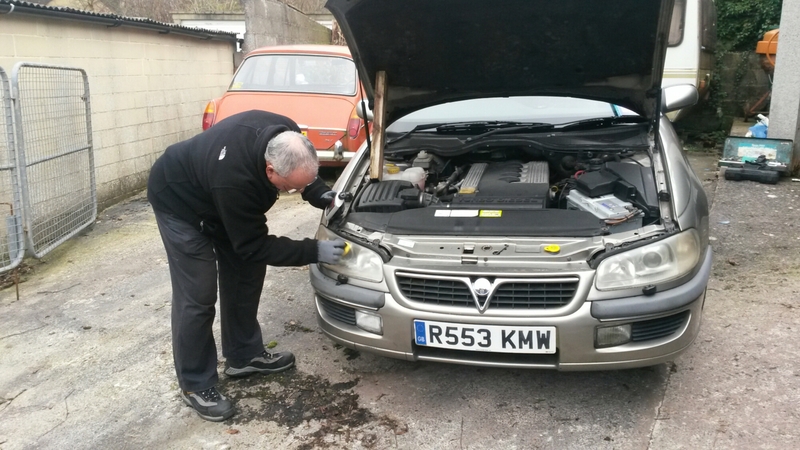 He came to ensure there were no problems driving the Omega away, led me across the confusing roads of Bristol to an MOT station that could squeeze us in at zero notice, and guided me towards a supermarket for the purchasing of lunch. He also put up with me calling for advice, rang around diesel specialists and did his best to find someone to work on the car. On a Friday afternoon. In that, we were not successful, but the effort was certainly appreciated. Next, Ashley at Mermaid Vehicle Services. Frankly, if you drive into a yard, and it looks like this, you know you’re on to a winner. Oh let’s have another photo! See? My new car isn’t so big. I know he was desperate to try and fix the diesel leak (who doesn’t love trying to access the inaccessible while being sprayed with diesel? ), but we couldn’t acquire the necessary seal – it by now being quite late on a Friday afternoon. I was left wondering what on Earth to do, when a silver XM smoothly cruised into view. It contained Stephen Doel. As he offered me such tempting things as warmth and food, I was amused to get a similar request from his better half on Facebook! I could hardly refuse. We had a lovely evening, and I got to wake up to this view. I’m also thankful to all those who followed this Caper, whether on social media or various forums. When you’re at your wits’ end after one disaster or another, it’s nice to run into a bank of suggestions. It’s also nice to be steered away from just setting the sodding thing on fire. Every project has its dark moments, and The Internet can be a refuge when you’ve just had enough. Project OMG: A busy day! I awoke this morning in (slightly) snowy Wiltshire. The Omega clattered surprisingly quietly into life, thanks were passed on to very wonderful friends, and I set off for Bristol and the only diesel specialist I could find that was open on a Saturday. A snowy start to the day. I arrived there just before they were due to open, but my haste was not rewarded. The man’s computer said the seal that was probably at fault was tricky to repair, as you can very easily destroy the metering settings. I wasn’t convinced he was looking at the right bit, but he showed no desire to actually go and look at the car, preferring to point at a diagram on his computer. He did admit that they didn’t have the seal in stock, which is a bit annoying given we’d phone the place yesterday, and they said they had both types, albeit only available as part of a kit. Oh well. I’d saved myself £45 at least. I was a bit stumped at this point. If I couldn’t get a seal, how was I going to stop the leak? There seemed only one answer, and it called for desperate measures. Yes reader, I went to Halfords for bodgery supplies. Not that this went smoothly. Having located a Halfords and entered the details into the sat nav, the Omega refused to come out of Park. There’s a safety lock so it’ll only release if you press the brake pedal. I was pressing the brake pedal! It still did not release. Google came to the rescue though, revealing that if you lift the trim off the selector, there’s a yellow override button you an press. Phew! That was good, because I was all set to just abandon the sodding thing at this point, double yellows or no. Press the yellow switch! Phew. There we go then. Got moving, thank goodness. Off to Halfords I toddled, failing to get any photos it would seem, other than this rather flimsy photo of the leaky pump. The culprit. Buried under an inlet manifold. That’s after I gave it a good degrease. You see, I think the bloke I spoke to earlier was wrong. I think he was on about the gasket at the base of the piece you can see (not quite in shot). The leak is from the lid, just below those bolt heads. I bought some magic tape that is said to seal anything, but access was too poor to use it. Also, that anti-tamper screw housing on the corner rendered it hopeless. I needed tension all the way around. I couldn’t see any magic potions that look like they would work, so I decided to use aluminium tape. I’d bought a roll to ‘fix’ the exhaust, which it did very nicely. Could it seal a pump? Well, no, not really. I could see diesel was just starting to seep out. However, that was better than dribbling out, so I decided to chance my arm. I went back to the MOT centre, explained my new ‘stuck in Park’ bodge, and tried not to look too nervous. He checked the spring, ticked it off. He checked the exhaust, ticked it off. He lowered the car, opened the bonnet, looked a bit confused, then called his mate over. Oh dear. I didn’t like the look of this. However, his mate remembered the car coming in yesterday and peeing diesel all over the place. Now it wasn’t dropping any, I got my pass! Petrol station shot. Time to go home! After putting fuel in, I grabbed a rather sorry-looking pair of pants and wrapped them around the pump to try and absorb any further fuel. I could finally point the nose of my new car towards Wales! I’d love to say that was the only problem, but as we entered Wales, an alarming relay click suddenly went off. Very loudly. Repeatedly. It did this every time I went over a bump, or cornered too quickly. Ugh. I’d rather lost my enthusiasm at this point, so just pushed on for home. Home! The Great Western adventure is over. However, I’m back. The car can now sit on the driveway while I work out what to do with it, and I can crack on with actually trying to get it into my name (the owner still hasn’t found the V5…). It doesn’t feel like love at the moment. It feels a bit too ‘hard’ for my liking. I don’t like the seats. Or the controls. I do like the lusty growls that emit from under the bonnet, and the gearbox seems pretty well behaved too. So, we’ll see. Place bets now for how long this one will stick around! Well, I can’t say today hasn’t gone to plan, because I had always assumed problems could occur. Having had the MOT fail, the next problem was fixing the issues. Our initial garages were too busy, but a friend recommended a garage in Wiltshire. So, I gave them a call and headed over. We quickly diagnosed that the diesel leak is the top gasket on the pump. Simple to fix, if and when I can get a gasket. That gave enough confidence to address the spring. Ashley at Mermaid motor services had already ordered the spring, which turned up just as the broken one had been removed. There was an issue though. It was not identical. That’s the broken one on the left. It seems replacement springs for Omegas with self levelling are not available. Oh dear. 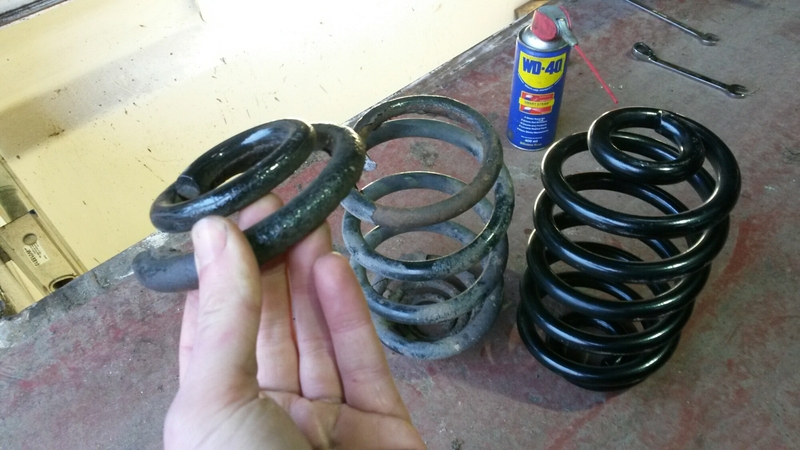 We fitted the wrong spring, and the car feels fine. I will need to correct this at some point, or at least get a balance across the car! So, that’s one of the three fails dealt with. I need to get the right gasket to deal with the pump tomorrow – any help there appreciated – and get an exhaust bandage to bodge that up. I was feeling very stuck, but then my mate Stephen Doel magically appeared and offered me food and warmth! The project is now on hold for the evening. I haz cats! Project OMG: I like it! All looks good. Some rot on the rear doors, and very little on the rear arches. Had a qtick drive around the block around and all seems well. We’ve even polished the headlamps. There is a smell of diesel, which I reckon is the pump. It’s not dropping any though. Exhaust has a hole in it. Hopefully that can be welded up. We’re hoping to make it to an earlier MOT so more news later. The drone of a tired wheel bearing was overcome by polite conversation as we headed out of Wales and into England. 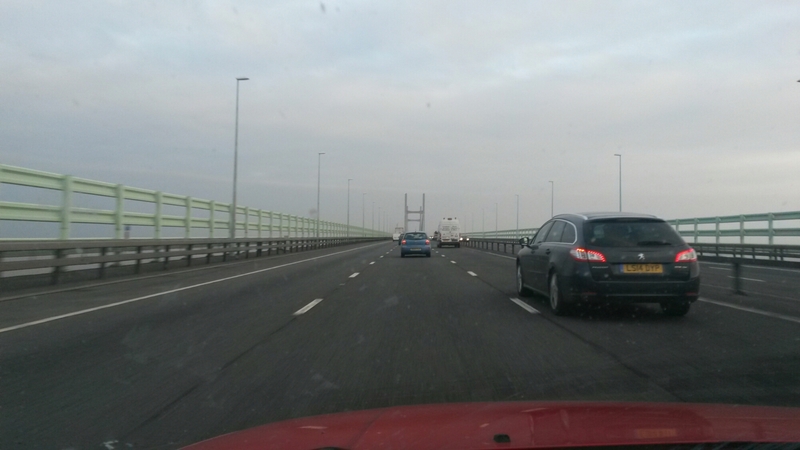 Traffic levels were relatively light, until we left the motorway and headed towards Filton. 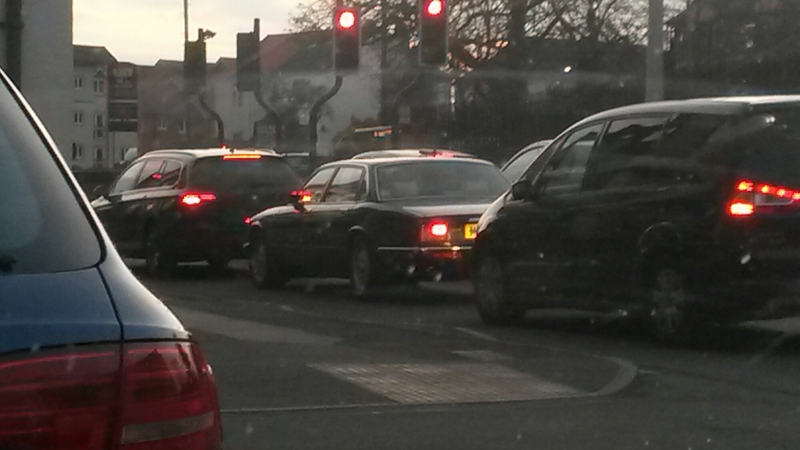 This classy Jaguar XJ 40 was about as good as spots got, as we crawled our way through the busy streets of Filton. Then, just before we reached my stopover, the mother of all spots. 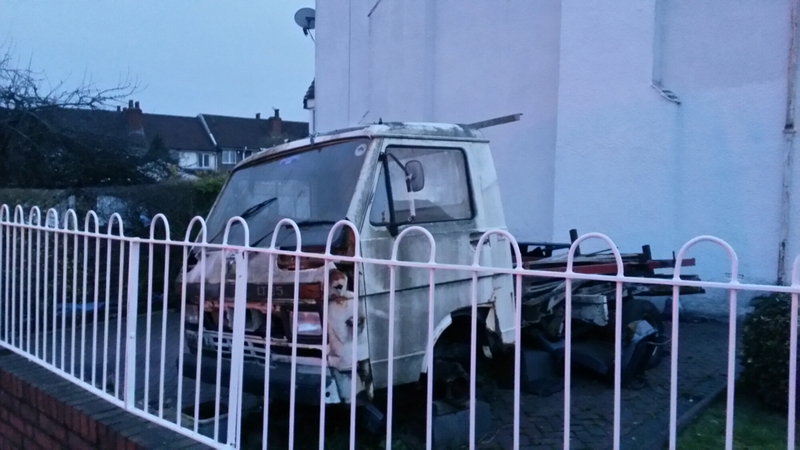 Who doesn’t love a decrepit Volkswagen LT? 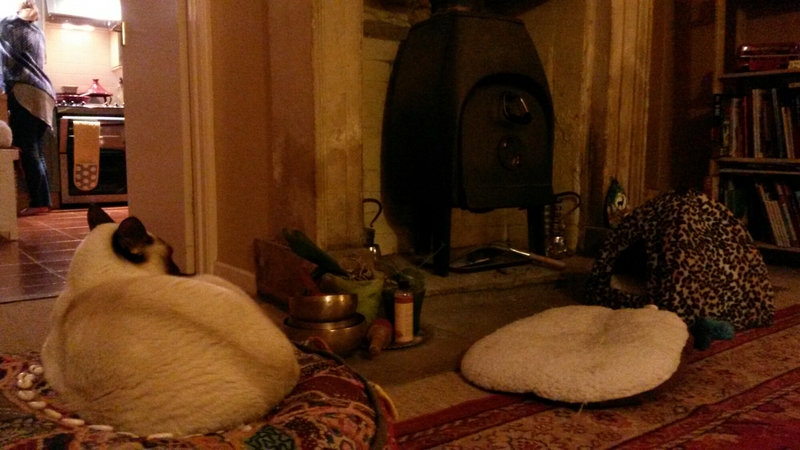 I’m now out for food – Grounded on the Gloucester Road is very pleasant. Many thanks to Jasper for giving me a lift. He is playing with Songdog on the other side of Bristol tonight. If folk noir is your thing, head to The Thunderbolt tonight. We are now on our way to Bristol! I was expecting a Mitsubishi Delica, but it seems that a Volkswagen Golf Mk3 is the taxi. You’ll be pleased to know that it desperately needs a service, and has a tired wheel bearing. Or two. 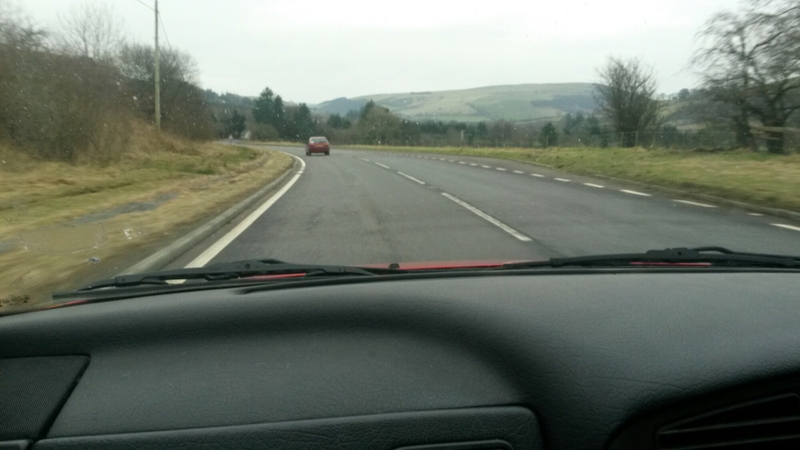 But, we are already in Powys as we head to Bristol. This Crazy Car Collection Caper is on! The new car: Project OMG! I was going to try and hide the identity of my new car from you, but leaks have started to appear in my attempted secrecy. So, here you are. My first Vauxhall! Yup, I’ve acquired me a Vauxhall. Almost. That picture represents all I’d seen of the car when I agreed to have it. I knew it had been off the road since the summer of 2015, parked up with a minor fuel leak. 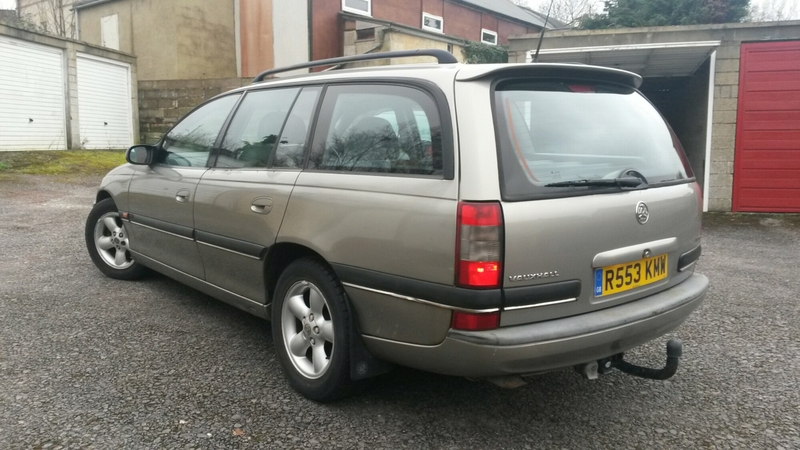 It’s a 1997 Vauxhall Omega Elite TD auto estate, so pretty darned high-spec. Not my usual thing at all. In fact, I’ve never owned any Vauxhall, perhaps hoping that I might one day begin that adventure with a Senator. I love Senators. More photos have since surfaced of the car. Disappointingly in some ways, it has been cleaned. Mind you, to be fair, the owner has also ensured it runs and drives after its lay up, which leaves me feeling at least slightly comfortable about Friday. The story so far is that I’m heading to Bristol with a friend on Thursday. I’m staying with a complete stranger that night, courtesy of AirBNB. 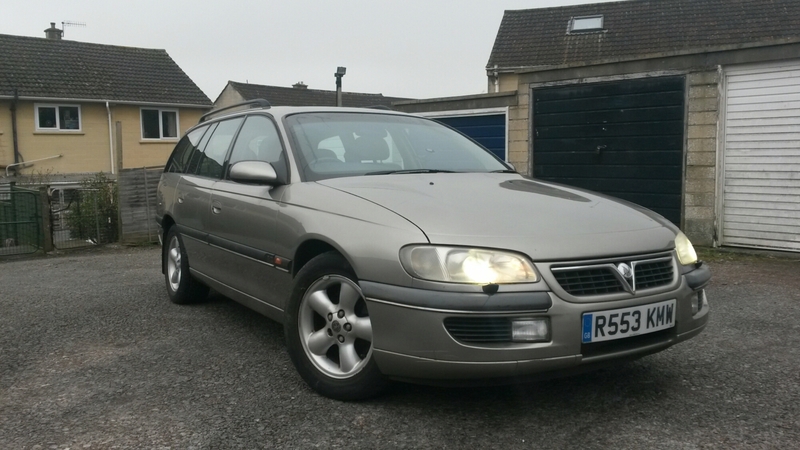 Then, the owner is picking me up on Friday, while a chap I bought a car from five years ago will be joining us in Bath. 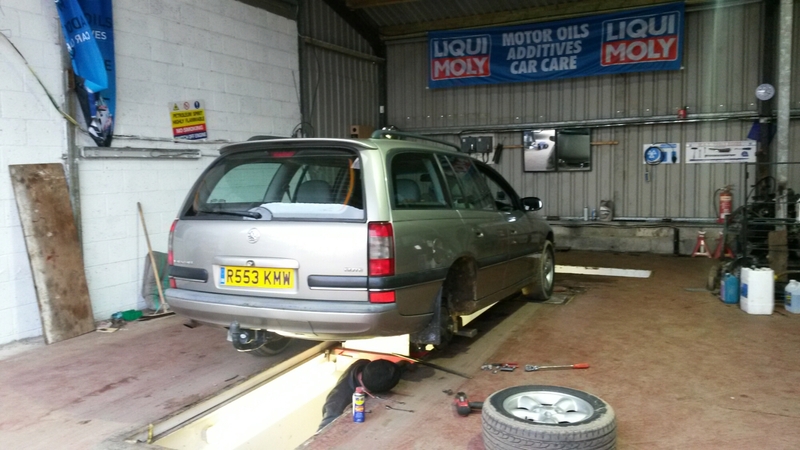 We’ll do the paperwork, check the car over, fix a few small things (sidelight bulb out, check how bad a reported diesel leak is) and hopefully take the car for MOT at 2:30pm. If it’s a pass, then I shall drive home triumphant. If it’s a fail, then I don’t really have any back up plan at the moment. Too many variables. We could find ourselves carrying out minor repairs, or it could be something major that scuppers the caper. I’m not going to bother worrying about it. The ultimate fallback is to catch a train home. It certainly promises to be exciting, and I’ll do my best to Live Report along the way – apart from when I’m driving, obviously. If it all goes quiet, well, hopefully that means I’m driving it home. Naturally, a video will be forthcoming. Already, excitement levels are rather high.